Australia are sweating on the fitness of Ben Hilfenhaus ahead of the second Test in Leeds, after the fast bowler hurt his left shoulder diving to save a boundary on the fourth day at Lord's. Hilfenhaus was in obvious pain after the front-on lunge, although he remained on the field and sent down the next over to see how the problem affected his bowling. However, straight after that over Hilfenhaus left the field to receive treatment, and while he returned to the action, he didn't bowl again in the innings. The captain Ricky Ponting said Hilfenhaus could have bowled again later in the day if required, but the real test will be how he recovers over the next couple of days. 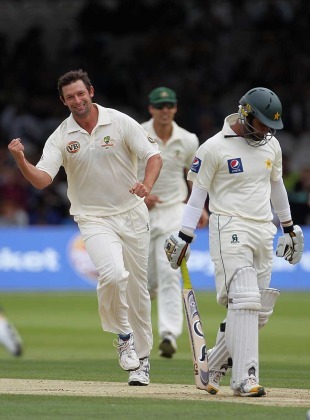 "You won't stop him bowling, it doesn't matter what he does," Ponting said. "He would have been fine. He is a bit sore in his shoulder. They will probably have a look at it tomorrow once it has cooled down and will know a bit more about it then. We don't really know the extent of it today and we just keep our fingers crossed and hope it's not too bad." Hilfenhaus was without doubt the best of Australia's three fast men, as he used the cloudy conditions to curl the ball sharply back in to the left-handers and away from the right-handers. He finished with match figures of 3 for 74, more wickets than either Doug Bollinger or Mitchell Johnson managed for the game. Johnson bowled well in the first innings but started to lose his radar in the second, often bowling too straight, and he struggled to 0 for 74 from 18 overs. Bollinger's battle with English conditions continued - he was disappointing in his only season of county cricket in 2007 - as he battled to find any swing and collected two wickets, both in the first innings. "I really think it was a fact of both those guys really trying too hard, knowing the conditions offered quite a bit for the faster bowlers," Ponting said. "I think they just tried to exploit a bit too much from the wicket rather than just being patient and hitting the areas long enough and waiting for the wicket to do something for them." The only other fast man in the squad is the two-metre-tall Peter George, from South Australia, who will be keeping a close eye on Hilfenhaus in the next few days. George played in the tour match in Derby but didn't pick up a wicket.